Hello and welcome to my blog…Deb’s Adventures in Academia…aka Debsadac. I’m currently studying for an MA in the History of Medicine with the University of Leeds, as an (extra) mature student. 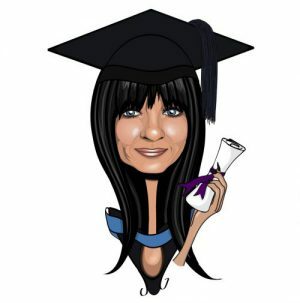 I wanted to write a blog about my experiences with studying for my Open University degree, as it was too precious an experience to just leave to my (appalling) memory. But when I then chose to take a postgraduate degree I thought it would be an excellent means of documenting my new undertaking down on paper so to speak. In 2007 I decided to take a taster module with the Open University…and I found myself at the start of a journey which lasted for 9 years and only recently ended with me obtaining a Bachelor of Arts (Hons) in Classical Studies with First Class Honours, in July 2016. Yet the journey hasn’t really ended at all and it didn’t really start with the OU. I discovered I had a passion for the Classics when I was approximately 14 and first read I, Claudius. I’d seen the TV programme and wanted to know more, so I decided to read the book, followed by Claudius the God. Following on from that came my love of Greek, Norse and Egyptian mythology. Unfortunately my love took a hiatus when it came to actually turning the passion into anything more than reading about it and of course life took over and it was only when I started to read the, for me, life changing Sunne in Splendour by Sharon Penman, in the late 90s that the flame was rekindled. I read all of her books and decided to delve into the actual history surrounding the medieval period through non fiction. This led me to Alison Weir and other authors of non fiction and of differing periods, from Henry I and the sinking of the White Ship in 1120 to Elizabeth I’s demise in 1603. This 500 year piece of history has therefore kept me engaged and absorbed since then and it was only in 2007 that I decided to add academic structure and a sense of purpose to my reading, by embarking on a degree with the OU. Something I discovered during my OU studies (amongst other things) was that I had a very keen interest in learning about the history of medicine. Unfortunately the OU didn’t have any further modules in this after A218, so I decided to take the plunge and go to study in a brick University. So this blog is a retrospective look at the OU modules I took, a kind of aide memoire for myself really as I feel the journey was too precious to be forgotten about. It’s also an ongoing voyage into the further unknown, as I continue along my current undertaking which is a Masters degree in the History of Health, Medicine & Society at the University of Leeds.